Few loudspeaker manufacturers can succeed in todays competitive market without a home-theater setup. This review covers Vandersteens Home Theater System 1. For $3440, the system includes: floor-standing 1C main speakers with metal bases, a VCC-1 center channel, a pair of on-wall VSM-1 surrounds and a V2W powered subwoofer. Vandersteen reworked the existing 2W/2Wq subwoofer to create a home-theater specific subwoofer designed to interface with both the Dolby Digital and DTS Low Frequency Effects channel. The back panel of the V2W contains normal and inverted RCAs for the LFE input, a level control, and a variable phase control so the V2W can be integrated with the other loudspeakers no matter where it is placed in the room. The V2W has three down-firing 8" woofers. These are equivalent to the cone area of a single 14.5" driver, but there is far more voice coil to cone area with the three 8" drivers for better drive and motion control of the radiating surface(s). The front side of the V2W contains a coupled-mass, third-order 12" passive radiator, which adds the impact and air motion you need for a visceral home-theater listening experience. 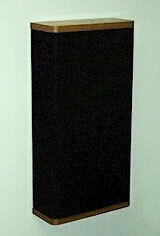 This passive radiator is not used in the other Vandersteen subwoofers. The V2W amplifier provides 300 watts of power and incorporates Feed Forward Error Correction (FFEC). This method of error correction prevents errors rather than limiting them the way a servo-system would. FFEC requires carefully characterizing the output of the subwoofer in all conceivable operating conditions, then analyzing the output to look for errors. When an error is detected, the inverse of this error is built into the on-board amplifier. In this way, errors are actually prevented. The amplifier module on the back of the subwoofer has low-profile heat sinks. Some air circulation is needed around those heat sinks, but 6" or so of clearance to the wall should be adequate. There is a long, captured power cord for the amplifier. 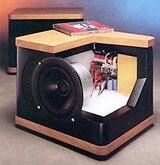 Construction of the subwoofer is similar to other Vandersteen loudspeakers. It has a wood top and bottom which are available in several finishes, and a black grill sock covers the four vertical sides. Three steel spikes with lock nuts are provided to couple the V2W securely to the floor. The downward firing drivers are slot-loaded into long narrow slots at the bottom of each side. This greatly reduces unwanted higher frequencies audibility at the listening position. There is no internally adjustable crossover in the V2W, but the nominal crossover slope plus acoustic crossover slope is 12dB per octave at 150Hz. In addition, the amplifier interface is designed to work in conjunction with the surround-processor output to achieve an overall 24dB per-octave slope when the V2W is connected to the surround processor. Priced separately at $715 plus $85 for the optional metal bases, these 2-way speakers have earned a reputation as high-value music reproducers. The 8" woofer and 1" critically damped alloy tweeter are in separate enclosures. The tweeter is in a sealed chamber that is barely larger than the tweeter itself. 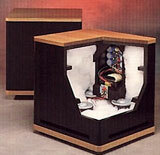 The polycone woofer is in a highly damped transmission line enclosure. The tweeter chamber is recessed from the front of the speaker, and the woofer is mounted on a tilted surface. Both techniques integrate the sound from the two drivers so that the listener, at reasonable distance and height, is placed within the time-aligned sonic window -- more on this later. The 1C is not magnetically shielded so it needs to be placed at least 10" from direct-view monitors. Rear-projection video monitors will place the 1Cs well away from the CRTs so that magnetic interference is not a concern. I had the 1C speakers placed about 18" from a direct-view monitor and had no problem with hum or incorrect color on the monitor. Frequency response is rated at +/- 3dB from 38Hz to 22.5kHz, and the crossover frequency is 2800Hz. The 3dB point on the bottom end seemed about 6dB higher than the rating in Room 1 and 2. The exit slot for the woofers transmission line is on the back of the speaker at floor level. Bass frequencies 100Hz and lower can navigate the damped transmission line while higher frequencies are reduced in level by the damping. This improves bass extension without radiating uncorrelated midrange sound from the backside of the woofer cone into the room, which would add distortion and time-delayed smearing in the midrange. Speaker cable connections are via single banana plug sockets, bi-wiring is not supported. The optional metal bases are highly recommended. They only raise the 1C speakers a few inches, but they give the modestly-sized speaker some needed mass at the bottom, and offer a more mechanically ideal attachment point for the supplied steel spikes. The smallish 1C is relatively acceptable to domestic partners who sometimes de-select speakers faster than we can find good ones. The VCC-1 center channel is a significant design departure for Vandersteen. It is a shielded two-way design employing a single 6.5" coaxial driver with a 1" critically damped alloy dome tweeter with a 3500Hz crossover. The tweeter is stationary, mounted in the center of the woofer cone. The uniform (with one exception) hemispherical radiation pattern of the coaxial driver is just what Vandersteen was looking for in a home-theater speaker. No matter where you place the VCC-1, under a monitor or on top of a monitor, you get a perfect radiation pattern at the listening position. Furthermore, several people sitting side-by-side on a couch or in chairs will all get the same ideal radiation pattern. The one exception is directly on the axis of the driver. Coaxial drivers produce a partial null along the axis of the driver. What this means is that you should never aim your VCC-1 directly at the listeners. This is no problem when using conventional monitors, rear-projection sets and solid projection screens. The exception is perforated projection screens where you place the center speaker behind the screen. In those cases, simply place the VCC-1 above or below the listeners heads rather than in the center aimed right at them. The VCC-1s back is open to prevent internal reflections from bouncing back against the cone, which is a significant source of distortion, especially in a small enclosure like that of the VCC-1. Speaker cable connections are via a barrier strip with Phillips screws. Spade terminals are the only connection option for the speaker cables. Bi-wiring is not supported. There is a "proximity" switch on the rear panel which provides compensation for placement close to a wall. The VCC-1 is not designed for low frequency extension, which is generally not needed in a center/dialog speaker. Frequency response is +/3dB from 80Hz to 21kHz. The VCC-1 is available separately for $495. half-as-tall and half-as-thick. The VSM-1 is supplied with wall-mount brackets because the VSM-1 is designed to be wall mounted. If you cant wall mount, youll need stands that place the VSM-1 in very close proximity to the wall. Conventional speaker stands probably wont work because the VSM-1 is so thin (5"), that it is not very stable sitting on its base. The VSM-1 has the same null along the axis of the coaxial driver that the VCC-1 has. The placement of the VSM-1 on the wall, to the sides of or behind the listeners, and preferably a little higher than ear height, will always place listeners in the sweet spot of the coaxial drivers radiation pattern as intended. The VSM-1 is not intentionally low-frequency limited like the VCC-1. Rated response is +/- 3dB from 60Hz to 21kHz. Speaker connections to the VSM-1 are via the same barrier strips and Phillips screws used in the VCC-1. Again, bi-wiring is not supported and spade connectors must be used on the speaker cable. The speaker connections are in a relieved area at the bottom-rear of the speaker, so speaker cables must "climb the wall" to reach the bottom of the VSM. There wont be room for big fat vacuum cleaner hose-sized cables, but any cable of reasonable size will fit. Time and Phase coherent -- what does it mean? Conventional loudspeaker crossovers introduce phase shifts and time delays into the reproduced audio signal. These phase shifts and time delays do not exist in the original recordings so they can be considered to be 100% distortion if you take the purist approach. The alternative school of thought is that the delays and phase shifts are of small enough magnitude that they can be ignored. The vast majority of loudspeaker manufacturers do ignore making their loudspeakers time and phase correct. But there is a small dedicated group of loudspeaker manufacturers who steadfastly hold to the tenet that the "conventional wisdom" on the lack of audibility of small time shifts and fairly large phase shifts, is based on incorrect test procedures and/or incorrect interpretation of the results. They believe time and phase errors are audible and refuse to allow them into their products. Conventional time- and phase-correct loudspeakers like the Vandersteen 1C must be designed with a "listening window" in mind. Put yourself outside of this listening window and you enter non-time and phase-correct territory, where driver integration takes odd twists and turns that could easily convince a standing listener that the Vandersteen speakers are relatively wrong-sounding. You can really only hear conventional Vandersteen, and other time and phase-correct loudspeakers properly, when you are seated in the expected listening window. Only within that listening window will the sound be time and phase correct and properly integrated. The Vandersteen Owners Manual assists with a table that correlates your listening distance and the height of your ears from the floor. If you sit exceptionally high or low, very close or farther away than usual, you may have to tilt the speaker a little bit to get your ears into the listening window. Remember, when you hear conventional time- and phase-correct loudspeakers while standing, they probably will not sound right. Vandersteens VCC-1 and VSM-1 speakers, with the coaxial driver, overcome the limited listening window for those specific applications where a conventional time- and phase-correct listening window would be a considerable liability. Subwoofers dont have the listening window issue due to the omni-directional radiation pattern of low audio frequencies. a low note played on a violin or a snare drum whack. If the two drivers do not both start (and stop) at exactly the same instant, the sound is smeared, stretched in time, very slightly. The dynamic peaks from the two drivers would not be aligned perfectly which makes two slightly smaller peaks instead of a single larger peak when the sound from the two drivers combine within the listening window. You can physically move the drivers forward or backward slightly to align sounds coming from both drivers. People sometimes refer to this as "aligning the voice coils" of the drivers. Some manufacturers have even incorrectly claimed that their higher-order crossover loudspeakers are "time aligned," because the drivers are staggered. This incorrect information is perpetuated by the audio press who apparently do not understand the issue clearly enough. In fact, "aligning the voice coils" is not the objective and in most loudspeakers with staggered drivers, the voice coils are not aligned. The objective is to align the sound waves emanating from each driver, not align the voice coils. The crossover design affects where the drivers need to be positioned to align the sound from the drivers. In loudspeakers with steeper slopes, drivers would have to be staggered 10" to several feet in order to align transient peaks occurring in two or more drivers. Driver stagger that large is impractical for a number of reasons. The only other way to produce a time-aligned loudspeaker would be to use steeper slopes and to introduce controlled amounts of time delay within the crossover, not something for the faint of heart. Additionally, loudspeakers with on-board digital crossovers like Meridians expensive digital loudspeakers can be made time and phase perfect because conventional analog crossovers do not exist in those speakers. I used the Vandersteen Home Theater System 1 in two different rooms with two completely different sets of electronics. In Room 1, "the big rig," I moved out the normal reference speakers, Vandersteen 3A Signature and a pair of Vandersteen 2Wq subwoofers and replaced them with the 1C and V2W. The reference VCC-1 Signature was replaced with a standard VCC-1. My own VSM-1surrounds remained on duty for this review. A Belles 150A Hot Rod amp was used with the 1C speakers, a Parasound HCA-1201A mono amp was used for the center channel and an OCM-500 stereo amp was used on the VSM-1 surrounds. Speaker cables were JPS Labs NC up front and JPS Labs SuperConductor for the VSMs. Sources were most often a Pioneer DV-525 DVD player with mods, an Assemblage DAC 2.6 for music, and an Onkyo TS-DX777 A/V receiver used as a surround processor. I made use of an array of VansEvers, Richard Grays Power Company, PS Audio Power Plant, Quantum Life Symphony and AudioPrism Wave Guide power-related accessories. This room is 19.5W x 23.5D x 10.5 H. The system was setup with the main speakers on one of the 19.5 walls firing down the long dimension of the room. Construction of this room is conventional 2 x 6 wood framing, with floor joists covered with two layers of sub-flooring. Room 2 is directly below Room 1. Room 2 has carpet and padding over a cement floor, one wood-framed wall and three other walls, which are partially concrete and partially wood framing. However, even the concrete sections have 2 x 4 wood framing, fiberglass insulation, and finished drywall over the cement. The dimensions are 18W x 21D x 8H. In Room 2, the system fired out of one corner with the subwoofer behind the video monitor in the corner. I used the NAD T770 or Onkyo TS-DX777 A/V receivers in Room 2 along with JPS Labs UltraConductor speaker cable up front and JPS Labs Super Blue bulk wire for the rear speakers. A Panasonic DVD-A310 was the primary source. Few accessories were employed in this setup. For two-channel music, the system in Room 1 quickly revealed what you pay for when you get the $3495 Vandersteen 3A Signatures. In comparison, the 1C speakers sounded a bit out-classed in detail, transparency, top-end refinement, bass extension and detail, pretty much a you-name-it situation. What did you expect? A miracle? After a few days of listening to the little brothers, I could begin to appreciate the qualities of the 1C speakers. The hallmarks of their presentation were coherence and balance. Without the more expensive speakers as reminders of what was missing, you could acclimate quite well to the sound of the 1Cs. In this largish room, the bass of the 1Cs without subwoofer augmentation was not particularly powerful, but there was enough of it to drive the foundation of the music adequately. The 1Cs produce some really nice detail in acoustic and electric bass even if low-frequency impact was limited in this large room. Its very difficult to identify any shift in tonality of the 1Cs as you rise from bass to treble. There is a seamlessness to the presentation that helps the listener forget the speaker and concentrate on the music. There are missing elements in the presentation, but they are not obvious. Much like a party with a thousand guest, who would miss a couple of dozen? But drop a few obnoxious drunks into the same party and everybody notices them. Nothing like that going on here. If you can only have one system for music and movies, the 1Cs are excellent choices. The balance they strike and their lack of obvious errors make the 1Cs rather pleasant personal music transducers. While music reproduction is the forte of the 1C, their performance on movies will actually soften some of the harshness out of the soundtrack. In both cases, the presentation is spacious and decently detailed compared to similarly priced competitors. In Room 2, I was able to use the Clements stand-mounted 2-way 207di as a comparison for the 1Cs. While selling for about $215 less than the 1Cs, the 207di is also a first-order crossover loudspeaker, and shares musical prowess with the 1C. While the 207di is a very nice sounding medium-sized box speaker, the 1C has a more refined and upscale sound. The mids and highs have more detail and musical rightness. The bass of the 1Cs went deeper and was lower in distortion. The two speakers share a lot of similarities in tonality though, making the Clements sound like a smaller, lower cost Vandersteen speaker or vice versa. Both speakers share that hard-to-describe eager musicality. Our full review of the 1Cs can be found in the Review Archives. The combination of the Onkyo TX-DS777, DTS surround CDs, and the Vandersteen Home Theater System 1 was a musical revelation. This is how we should be listening to music. I dont want to hear complaints from retrograde cavemen who get all confused if they hear a voice or a guitar coming from behind or beside them. When the world moved from mono to stereo, your retrograde cavemen ancestors complained the same way about how confusing it was to hear music coming from two speakers. Take a tip from Don Henley and me, get over it. There are few mono enthusiasts left today. In 15 years there will be few surviving stereo purists. Always being stuck in your personal comfort zone is boring; expand your horizons, try something new. The biggest problem I see for ascendance of surround music is that most home-theater loudspeaker systems in the neighborhood of $3500 are not as musically compelling as the Vandersteen Home Theater System 1. The others may be fine for movies, even exciting sounding, but put music on them and all you can think about is mowing the grass, cleaning toilets, lubricating door hinges, or what it would be like to get a pedicure. Anything but the music. The big fat secret hiding in this home-theater speaker system is that music in surround sound can be glorious. Not, unfortunately, Paul McCartneys Venus and Mars. What a total botch job on that one. The Vandersteen Home Theater System 1 reveals all manners of ill-advised localization choices, problems with the master tapes and a general dull pall over the entire recording. On the other hand, Stings Ten Summoners Tales is revealed to be even more of a gentle golden musical breeze than the stereo version. Brian Wilsons Imagination comes across as far better mixed and balanced than the stereo version, especially from the midrange up. Toy Matinee exceeds the excellent stereo CD. Alan Parsons On Air becomes fully realized for the first time with the System 1, throwing a rather exciting and large soundfield, which made the room disappear completely. And The Mavericks Trampoline bounces far higher in 5.1 with fine tonality and a conservative use of the surround channels. All of these titles reveal the true strength of the Vandersteen Home Theater System 1the joy of music and the absence of obvious transducers. All right, pop in your favorite reference-quality DVD and what are you likely to hear? Movie soundtracks without the hard edge you are used to at similar price points. Seamless soundfields, convincing pans, very good localization, in-the-room-with-you dialogue, and musical interludes to die for. On the other hand, you dont get quite the edge some people seem to be demanding in their home-theater systems. Whether the monsters teeth are 4" long or 6", youre going to take serious damage either way. What Im not absolutely certain about is which of the two presentations is more accurate. The harder biting systems sound more like what you hear at most movie theaters, but I never like the sound at most movie theaters anyway. Ill take the presentation of the Vandersteen System 1. I mean, just how much more do the bullet and shrapnel hits need to be driven home in Saving Private Ryan? How much more threatening can The Haunting house be? If your skin is already crawling from the Vandersteen System 1, how much more could you want? But if you are one of those people who must hear every last tendon snap and bone crack as if they are inches from your head, your preference may lie elsewhere. But know this, when the music soundtrack kicks in, youre going to be sorry. The benefit to the Vandersteens balance is that you almost never find movie soundtracks too harsh or headache-inducing as they can be with more hell-bent home-theater speaker systems. There are systems Ive heard where Cinema Re-EQ is required for all movie soundtracks and really doesnt reduce the harsh edge on some soundtracks enough. With the System 1, I never engaged Cinema Re-EQ except for one particularly harsh laserdisc soundtrack. What about the bass you ask? Well, the V2W is a monster. It doesnt seem possible that a single subwoofer in a room as large as Room 1 could move the air, the structure of the room, and the furniture to the extent that this subwoofer does. This is done with no hint of overhang or distortion. This sub doesnt jump or slide around on the floor like lightweight compact subs can either. The Haunting and The Mummy have some state-of-the-art movie bass in them and the V2W was just amazing, so much so that Im thinking about adding one to my system in spite of already having a pair of 2Wq subwoofers. In The Mummy, the heroine knocks over a bookcase in the library. A chain reaction ensues where one bookcase knocks over the next like dominoes. When the last one hits the floor there is an incredibly solid slam from the V2W which almost lifts the couch off the floor. So while the other speakers in the Vandersteen System 1 may have a little less bite than some of the competition, the V2W subwoofer gives no quarter to competitors. It is powerful, solid, and very low in distortion compared to other subs close to $1250. Generally, I dont hear this level of performance until the subwoofer price goes beyond $1800. Subs priced close to or lower than the V2W generally have some cabinet issues, have audible overhang, and they clearly distort at normal listening levels at points within their operating range. Never once did I have a desire to see just how loud the V2W would go without obvious distortion. It was already playing so loudly on effects peaks that I was at my comfort limit. In a room as large as Room 1, a single subwoofer selling for $1250 that can do what this one does is a rather surprising accomplishment. A word about how the 6 speakers integrate with one another. WOW! The 1C, VCC-1 and VSM-1 share an uncanny similarity of tonality when you allow for differing amounts of bass ability between the models. Listen to them from 200Hz and above and they are freakily similar sounding in spite of the coax vs. conventional driver issue. The only time Ive heard a better speaker to speaker match has been when all five speakers are identical. Those systems had other issues; however, generally in dialog intelligibility, uneven radiation patterns, and getting the rear soundfield to lock in. Five identical speakers may seem logical, but there are issues because of the different role the speakers in each position must play. The subwoofer integration was as good as any Ive experienced so far. I used test tones to set the subwoofer level and to tune the variable phase control to the best setting. Within 15 minutes I had it locked in and never needed to change it, unless there were system or room changes. In fact, the subwoofer integration was so good that I tended to prefer to have it active when playing music through a surround processor. I expected the same oppressive bass character when using this subwoofer for music that I experience with other home-theater subs, but it only happened with the V2W in rare cases where the music contained a droning bass beat in a narrow frequency band that was a bit too prominent. When driven by an A/V receiver, the Vandersteen System 1 retained its essential goodness, and brought out the best in the receiver. Receivers generally choke very heavily and obviously when speaker loads drop below six ohms. None of the speakers in the Vandersteen System 1 caused either receiver the slightest difficulty. Even with the more popularly priced speaker cables, the Vandersteen system would still throw a respectable soundstage and retain subtle spatial characteristics in movie soundtracks. Certainly some transparency and detail were lost compared to the higher performance and higher cost cables, but the loss was not cataclysmic. The A/V receiver setup brought the whole presentation down a notch, but given a few days of acclimation, the memory of the higher performance setup would fade and I was able to enjoy music and movies without having my attention constantly drawn to limitations of the audio hardware. In Room 2, with concrete floors and partial concrete walls (behind a normal wood frame, insulation, and drywall), the bass was tighter, although it was not able to give the sensation of moving the furniture. However, sound-pressure levels were measurably higher for similar level settings on the subwoofer. Floor conduction is a definite element of visceral bass. The mass and stiffness of concrete in the floors and walls prevents their cooperation in bass augmentation compared to framed floors and walls. Yet the stiffness of concrete holds the bass energy in the room more effectively than in a wood-framed room. I tended to prefer the quality of bass in Room 1, but thats not reflective of the Vandersteen System 1. So far, Ive liked the bass of every loudspeaker system in the completely wood-framed Room 1 over the cement Room 2. Hearing the Vandersteen System 1 with two different receivers makes me want to jump up and down and grab people by their ears to hear what can be accomplished in a $6000 home-theater system with a $1000 to $1700 receiver. I was honestly a bit excited by how well the receiver-based systems performed. It was something of an education, one worth experiencing for yourselves. There was plenty of resolution in the System 1 to clearly reveal the sonic differences between the slightly brash and forward Onkyo and the more relaxed and refined NAD receiver. There was also plenty of resolution to hear the differences in speaker cables and other system tweaks. The $3440 Vandersteen Audio Home Theater System 1 is most certainly a very strong contender for your attention at this price point. It will appeal most to people who have to have one system for music and movies and who like music as much or more than movies. Have a listen just to be sure, but I cant imagine youll be disappointed. If youre a gimme-it-all kind of home-theater person and want movie sound as nasty as it wants to be, perhaps there are better choices out there for you. 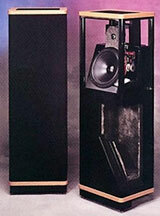 Either way, you have to respect the end result Vandersteen achieved with this system. $3440 is a serious price point for home-theater speaker systems. It can be a step-up for people who own less expensive loudspeaker systems. In that role, the step-up system had better sound good with A/V receivers or customers will be less likely to select it. Once the customer is using speakers at this price point combined with an A/V receiver, the next likely upgrade is to go to separate amplifiers, then to a separate surround processor. If the speaker system is not good enough to continue to sound good with those upgrades, customers will not be happy with their choice. The Vandersteen System 1 works well in both roles and that is a significant value proposition for potential owners.